At Prime Minister’s Questions yesterday Theresa May was asked by three separate MPs – two of whom are Westminster party leaders – about allegations of Vote Leave breaking campaign spending limits, attempting to hide evidence of their doing so and using an agency (Cambridge Analytica / AggregateIQ) which broke data protection laws to make targeted adverts. 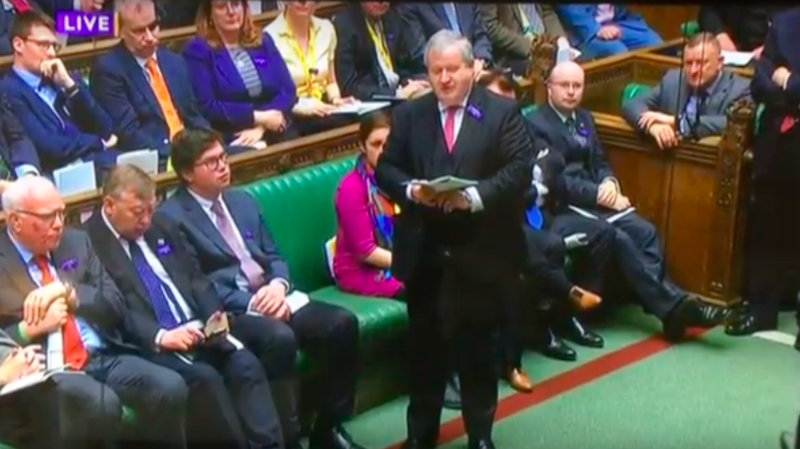 Caroline Lucas, leader of the Green Party, Ian Blackford, leader of the SNP in Westminster and Alan Brown, an SNP MP, all demanded answers from Theresa May. The Prime Minister’s responses ranged from dismissive to defensive and made clear that she has no intention of making this any sort of priority for the government. Firstly, the allegations can be seen as a potential threat to the legitimacy of Brexit – a project which will define May’s place in history. Secondly, three of the most senior members of her cabinet (Boris Johnson, Chris Grayling and Michael Gove) and Stephen Parkinson, one of her special advisors, are implicated in the controversy and she will want to protect them in order to protect herself. Thirdly, the DUP – the Northern Irish party who supply May with enough votes to give the Conservatives a majority when required – are embroiled in the scandal; anything which seriously negatively impacts the reputation of the DUP could bring about an end to the ‘confidence and supply’ arrangement. Whilst Theresa May’s tone was aloof, the content of her responses did clearly outline the possible avenues that those seeking justice on the two key allegations could take. Allegation 1: Vote Leave broke campaign spending limits by diverting excess donations to their agency AggregateIQ via the DUP, Veterans for Britain and BeLeave. Sanction available: Up to £20,000 penalty fine and / or refer the matter to the police or crown prosecution service. Allegation 2: AggregateIQ / Cambridge Analytica breached data protection laws. Sanction available: Up to £500,000 fine and / or prosecution of those who commit criminal offences under the Data Protection Act. What is clearly impossible is reversing the result of the referendum; there is no existing regulatory framework that could demand it and nor is there the political will to make it happen (Jeremy Corbyn didn’t mention the allegations in a single one of his six questions to Theresa May yesterday). However, if proven true, the scandal does question the integrity of the outcome and give further ammunition to those seeking to have a second referendum on the terms of the eventual deal between Britain and the EU. These unsavoury accusations are just another symptom of inadequate and outdated regulation and policing of election campaigns; the system needs urgent reform. Voters need to believe that elections are fair and that rules are abided by in order to be able to respect the outcomes of ballots. The very legitimate worry is that if Vote Leave go unpunished having lied in their main campaign messages (£350 million + Turkey), breached data privacy laws and exceeded spending limits, it will cast a long shadow over future elections in this country. Previous Trump 2020 slogan: Keep America Great!